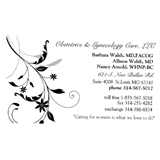 Obstetrics and Gynecology Care, LLC (St. Louis) - Book Appointment Online! Drs. Barbara and Allison Walsh and Nurse Practitioner Nancy Arnold are devoted advocates for women's health. They are committed to providing the highest quality of health care to female patients of all ages while maintaining a focus on each patient's individual needs. Drs.Barbara and Allison Walsh along with Nancy Arnold offer a full range of obstetric and gynecologic services, including: cervical cancer screening (Pap smears), contraceptive counseling, osteoporosis evaluation, and hormone replacement therapy. Beyond the office, should the need arise, Drs. Barbara and Allison Walsh provide a full range of gynecological procedures including, but not limited to, DaVinci robotic hysterectomy,Essure permanent contraception, endometrial ablation and laparoscopy. She made me feel super comfortable, would definitely recommend.